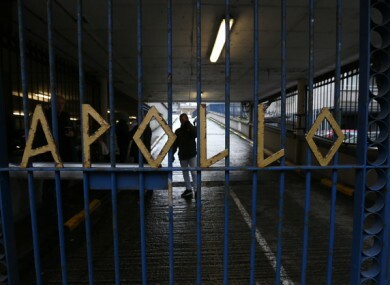 File photo of the gates of Apollo House. THE LORD MAYOR of Dublin Brendan Carr has called on the Home Sweet Home campaign to donate the remaining funds it raised to housing and homelessness charities. Carr said that the funds raised by the campaign should “be immediately put to use assisting people in housing need”. Home Sweet Home was the campaign involved in the high-profile occupation of a vacant Nama building in Dublin last December, for use as housing for homeless people. The Apollo House takeover generated huge public support and media attention at the time, with thousands of people signing up to volunteer with the campaign. The campaign succeeded in providing accommodation for over 205 homeless people over the course of the occupation. The campaign also raised close to €190,000 between 15 December and 18 January, mostly via an online GoFundMe campaign. The campaign spent about €60,755 throughout the course of the occupation and after, leaving about €129,000 left unspent. Following an article this morning in TheJournal.ie which spoke to members of Home Sweet Home and looked at the campaign four months on, Carr called for the remaining funds to be donated to charity. In a statement released today, Carr said the money was donated in order to help people in housing need. “This was the reason it was given to the Home Sweet Home campaign and to not put it to such a use immediately, I believe, is an abuse of peoples’ wishes to ensure the dire housing crisis in our city is effectively dealt with,” he said. “At the time of the Home Sweet Home occupation of Apollo House in Dublin, I questioned whether the campaign had the necessary abilities to make a long-term and effective contribution to ending the housing crisis. Since January there has been no evidence of the group doing anything constructive with the public good will and the funds it raised in late December 2016 and January this year. Carr went on to say that the renaming funds should be donated to “any of the several charities and organisations which have for many decades been doing all they can to both raise awareness and effectively deal with the cycle of crises provoked by the deep-seated structural issues in our country’s approach to housing provision”. “These monies need to be put to use now, they should not be kept unproductively in an account or used for other political purposes,” he said. Members of the Home Sweet Home campaign have previously told TheJournal.ie that the remaining funds would be going towards “legacy projects” to do with helping people in need. Spokesperson Rosi Leonard said that the campaign wasn’t “ready to announce” the projects yet. “But we’re working out legacy projects and ways to make sure the money goes towards the aims of Apollo House initially,” she said. Which was to essentially support community groups in ending homelessness, so that’s what we’re doing. It is believed that a proportion of the funds will go towards the opening of a community support centre in Dublin for people affected by the housing crisis and homelessness. This was stated as a plan by Home Sweet Home in January. Read: What has happened to Home Sweet Home (and the €190,000 that was donated)? Email “Dublin Lord Mayor calls for Home Sweet Home to donate remaining €129,000 to homeless charities”. Feedback on “Dublin Lord Mayor calls for Home Sweet Home to donate remaining €129,000 to homeless charities”.